Technology has gotten over great part of our lives, and there’s no exception when it comes to customer service. While some may argue if this is a right direction for the world, it surely does a great job when it comes to optimizing support work and making the customer experience better than ever. But what can you do to be the best at customer service and how to choose customer service software that will help you provide the best support for your customers? Stay with us until a couple of paragraphs more to learn about how this kind of tools can benefit your brand, sales and support and how to pick ones that fit you best. How will you benefit from good customer service software? If someone asked me about the benefits of having great customer service, the first thing that would come to my mind would be: to whom? The business or their customers? Giving it a second thought makes me realize, that it doesn’t really matter, as the company benefits from keeping their customers well-served and happy. Moving on, let’s see the specific goals good customer service helps you achieve. They say time is money. Don’t let your customers wait long to get their problems solved. Depending on the character of your business (and so, your customers), they will approach you for different reasons. Some of them will use it for research purposes – for example, if a software is what you’re offering, they may contact you to explain some features. Or advise them whether your product is a fit for their case. Or even compare it to the similar product your competition offers. Other popular case is more of a traditional way customer support. You may work in an e-commerce and your customer can’t find any information about your brand’s return policy, so he asks a question. Providing him with a quick answer doesn’t break the shopping process – if all of his doubts are resolved during one session it’s rather not possible for him to lose interest, or get frustrated and abandon the online shopping cart. Content marketing, PPC ads, cold mailing and cold calling – every industry has its very particular set of verified methods for driving sales. How can customer service software help you with getting new customers and boosting your income? Every time a customer approaches you, you get a chance to become his trusted advisor and have a real impact on his decision-making process. When he shares some kind of issue or asks if your product would be right for him, you can offer him a higher end version of a solution he considered as first. Or maybe your company has another product that could complement the first one, with benefits for the customer? These techniques are called upselling and cross-selling. But be careful, this kind of sales can bring you profit only when you really have your customer’s well being in mind – otherwise, it can be considered pushy, and, as the effect, you may lose the trust he gave you. Knowing that there’s a real human on the other side, ready to solve one’s specific problem with a few clicks, makes customers more eager to make a contact, share their feelings and, eventually, make a purchase. And it all comes to that after all. However, as social creatures and we care about personal relationships—they make us feel safe and comfortable. According to Robert Cialdini, we are much more likely to say yes to someone we know and like. And every salesperson is perfectly aware of that. Each time your customers contact your company, there is a touchpoint created and it affects how your business is seen as a brand. It’s a not-to-miss opportunity for you to raise the brand awareness and work on the brand image you want to achieve. Let’s say you want your brand voice to be friendly and witty. What you should do is use humor. It will make you memorable, build trust and encourage your customers to take and action. Every complaint you get from your customer, every issue you have to think hard to resolve, is a step further to improve your product or a service. And let’s not get our minds closed – even if the issue doesn’t give you any precious insights itself, a conversation customer initiates is a perfect opportunity to ask him a question (and there’s a chance they’ll be more eager to answer, than they would be if you contacted them with a questionnaire or a call). Do you think about a new feature you may apply to your website? Or want to know how good is your customer service experience? Don’t be afraid to ask them. How to provide good customer service? Though it may seem easy and effortless, good customer service is made of hours spent on developing, implementing and practicing different customer service software, tools, and methods. However, I can name a couple of factors that have an inevitable impact on the quality of your support. The first step on the road to great support is completing the right team. Optimize your recruitment process to hire people who have the good basis to be great at helping others. Long story short, you should look for traits like empathy, openness, listening skills and solution-oriented minds. After hiring the crew, make sure you spend proper time training them to know your product inside out and continuously improve. Be aware of the issues your customers deal with, as well as their habits and preferences. It will give you the power to choose customer service software, methods, and channels that fit their needs. You can carry out research, ask your current customers with a survey (use a free service like Google Forms or Typeform to get basic surveys going), or just simply observe what customer service tool helps them most. And then apply the feedback to your actions. Batman wouldn’t be the same without the Batmobile, and there wouldn’t be any magic if Harry Potter did not have a wand in his hand. What I mean is that every hero needs a tool that helps him do his job. Set of customer service software completed based on the insights you found when researching your audience will let you make 100% of your actions. What customer service software you can build your set from? Each year we release a customer service report, where we sum up the most crucial stats about businesses using chat tools. 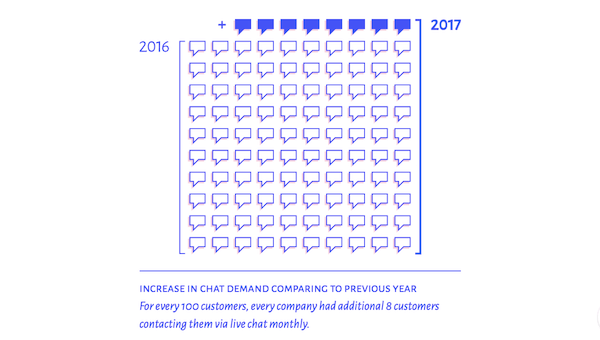 In 2017 there was an 8.29% increase per business in chat demand in comparison to 2016. What does it mean for customer service? Live chat is getting more and more natural channel for users. You’ve probably seen a chat window placed in the right bottom corner of the website more than once. I can bet that lion’s share of you also used it to get answers to some questions, at least once in a lifetime. That’s not an accident – currently, it’s the easiest and most effortless way to contact company’s representatives. This type of tool has been present on the market for a good couple of years and the competition between companies that offer that kind of solution is not small. What’s the good news here? 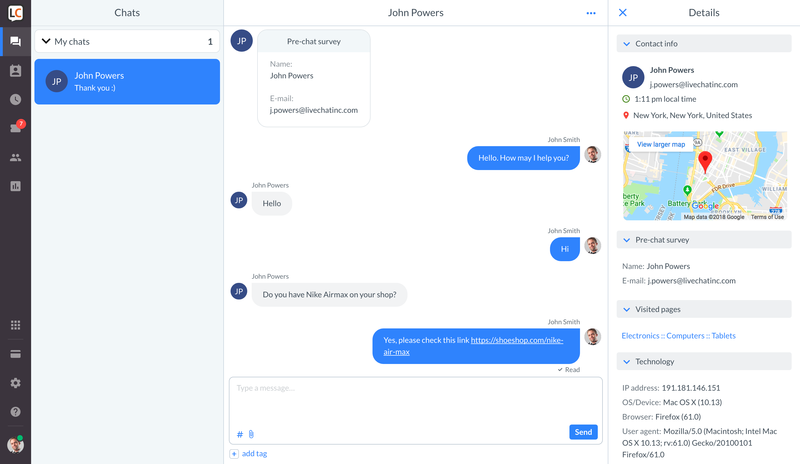 As usual on the free market, the competition drives the progress, what results in constant improvements, new features, that make live chat more and more user-friendly. Now, let me list a couple of ways live chat can help your business in different ways. For customer service, the main goal of any new features and improvements is to make the experience faster and more pleasant, both for customer and company representative. After all, live chat is all about solving issues in the real time, isn’t it? You can answer the questions even faster with canned responsesfor popular topics and collect the precious data about your visitors (such as country, gender, email address, etc.) to get more of the context. Sometimes it won’t be the first time the customer has some issue – with chat archives you can browse his previous conversations, so your agent could understand his situation faster and without unnecessary frustrations. Live chat tools usually have also some useful integrations with other platforms, for even better customer service. For example, we have a Facebook integration so your customers could talk to you within their Facebook chat. All chats are transferred to your LiveChat, so you don’t have to switch apps and save chats in your archives getting all the precious statistics. Plus, you get a set of various apps for desktop, web, and mobile, so you could talk to your customers from any place. Having the information about your performance gives you the chance to improve constantly. You can collect a feedback about the state of your customer service with surveys, or directly while talking to a customer. Sometimes, you’ll be able to get the insights basically just from the numbers. 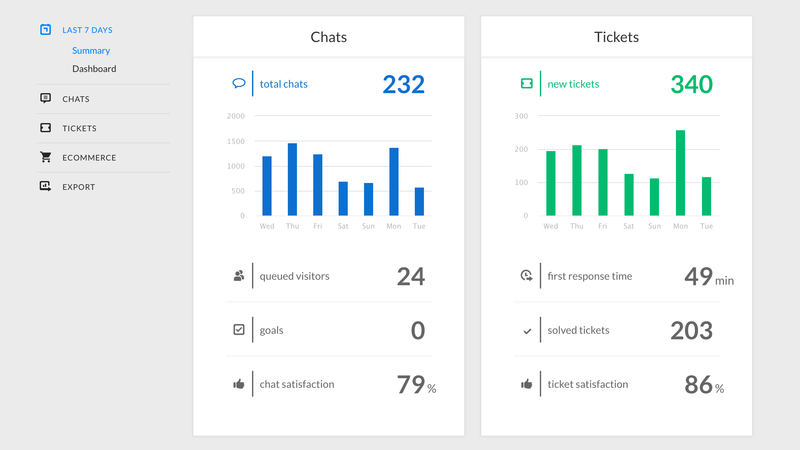 With LiveChat you can browse and analyze data such as a number of chats, chat satisfaction, average response time, your agents’ performance and many others. You can receive short daily reports or export chosen metrics as CSV file we’ll send right to your mailbox. As mentioned before, a conversation that was meant to solve a customer’s problem at first can turn into a great sales opportunity. With live chats, you can use some techniques to drive the attention to the contact opportunity and raise chances to have a conversation at all. One of them would be placing some eye-catchers or a pop-up window on your website. You can also set up multiple greetings that will invite your visitors to chat, based on particular actions they take. Thanks to the live chat you’ll be able to support him on the path to conversion with a specific and optimized message. Is someone spending more than 5 minutes on a pricing page? Your first message could be: “Did you find a plan you were looking for?”. This may probably solve a problem that may make your potential customer bounce. Another customer service software type that’s surely worth mentioning is help desk software. 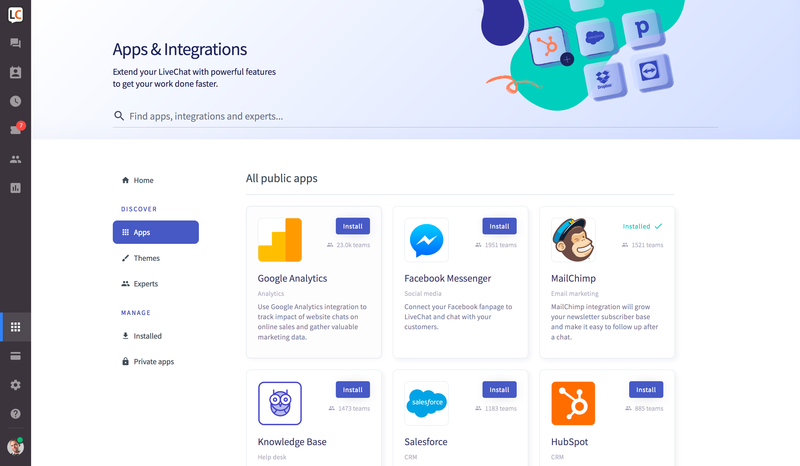 It’s a tool that helps your team keep all of the customer requests, conversations and issues in one place, so anything would go missing. If some case can’t be resolved at one time, or your representatives need to spend more than few minutes to get the answers for your customers’ questions, they can create a ticket and come back to it any time later. Let’s say you’re a retailer selling shoes online. You get an email from a customer who’s asking if, and when, the brand new model of some sneakers will be available on your website. To get the precise answer you have to contact your vendor, which can take some time. To not forget about your customer’s question and answer him as fast as you can, you create a ticket, that reminds you to come back to him later, as soon as you get all the information you need. It’s convenient to keep your customer service software down to the minimum, so at LiveChat we offer a help desk software that’s built right into the chat app. You can create a ticket directly from the chat window and save time not having to switch between different apps (and you pay for one product only). This one serves the optimization of the customer service process. If you spent some time supporting your customers through different channels, you can make a short list of questions they ask most frequently even when woke up in the middle of the night. To save the time of your agents you can prepare the answers and instructions for the issues that worry your customers most often. Then, there’s a couple of ways you can handle that. You can create a complex knowledge base for your customers to get the information on their own. Instead of having to provide all kinds of information during one on one conversations with your customers (over and over again), you can compile them into a knowledge base, what will save you hundreds of man-hours and money. And don’t worry about all the development you have to do, there is a software to do that for you. And if you decide on trying the live chat solution, you can integrate it with a chatbot software, that will replace some part of chats handled by your employees. As with the knowledge base solution, you list the most popular questions and teach your bot the answers to them. In return, you save time, money, and your customers get the support 24/7, no matter what are the availability hours of your agents. How to choose the best customer service software for you? I hope that reading this article will give you some basic outlook on the customer service software topic. Choosing the best tools for your business will depend on various factors and industry characteristics, but I think I can sum up with a couple of advices that will help you go through this process (and succeed!). Keep your software set down to the minimum – if you can cover many tasks with one tool, do it, it will save you time and money. Research thoroughly and go for a best price-quality ratio. 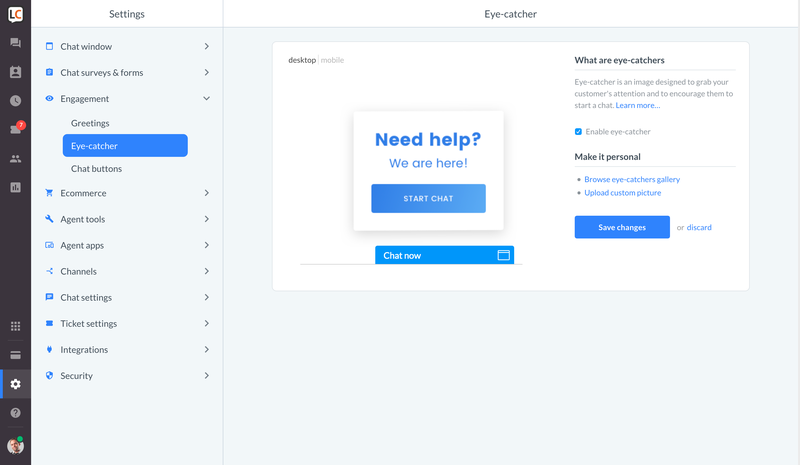 Look for light and easy interface – good UX will pay off for your team and customers. Before making a purchase, go through a trial to test the software (and it’s better to trust companies who offer a free trial option). Make sure that customer service software you want to invest in has a reliable support policy. Go for software that gets your work style and offers different apps, such as mobile. Use software comparison tools (like Capterra, GetApp or G2Crowd) to check the differences between customer service software you consider. 5-minute setup, test out the Team plan features for 30 days, no credit card required. Copyright © 2019 LiveChat, Inc. All rights reserved. LiveChat – customer service software for business: live chat software to increase sales · Free live chat trial · Comes with built-in help desk software.